Plus, producer teases more Final Fantasy Type-games. The game was first announced at Sony’s E3 press conference for PlayStation 4 and PS Vita, and was later detailed at Square Enix’s press conference. The world encompasses elements from a lot of other Final Fantasy games. For example, the scene where we see the characters on a bridge to a big castle, that castle is based on Cornelia’s Castle from the original Final Fantasy. You befriend monsters by battling them. There is a system involved, which Square Enix won’t disclose, but it is used to capture or befriend them. Some monsters can only be captured by clearing different storylines. You can change the protagonists’ sizes from small to big at any time with the push of a button. When you’re smaller, you can ride on monsters. When you’re bigger, you can stack monsters on top of you. The formation will affect the stats and abilities you use in battle, and you can also freely stack monsters. The new style is meant to draw in a younger generation to Final Fantasy. Tetsuya Nomura did the designs for the main characters. Some of the monsters are voiced and appear in the story. There will also be completely new monsters never seen before in Final Fantasy. Cloud and the Warrior of Light will appear in the game. All of the characters from previous games that appear will be part of the main story. There will be side quests for players who want to learn more about their stories. The story is about two siblings who came from a world of bigger people to a different world of smaller people, called “Grimoire. The game will have cross-save and be released in both physical and digital formats. The game will contain new songs, such as the song in the trailer created by Masashi Hamauzu, as well as re-arrangements of songs from previous Final Fantasy titles. Hamauzu is also handling those arrangements. 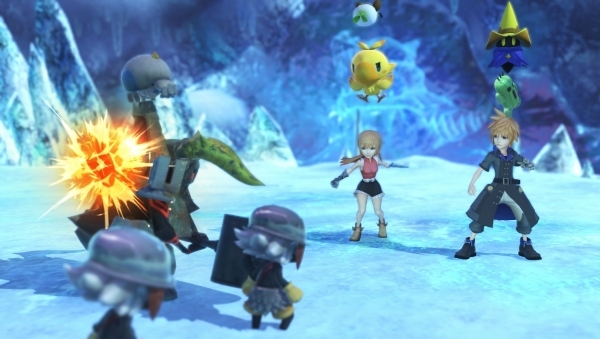 That’s all for World of Final Fantasy, but GamesBeat did quiz Chiba about that secret movie at the end of Final Fantasy Type-0 HD, which he worked on.